Ah, spaghetti and meatballs. Just the name makes me feel all warm and cozy. It is my quintessential comfort food. Hand me a fork and a big bowl of al dente pasta, topped with a garlic and basil flecked pasta sauce, juicy meatballs, and a flurry of freshly grated parmesan, and I will love you forever. I will love you even more if you also pour me a glass of wine, but that part is optional (most days). Over the years I have tried many different meatballs, starting with my mom's. My mom's meatballs are just regular ground beef (and none of that tasteless ultra-lean stuff) browned in a skillet and simmered in tomato sauce, and they are awesome. I could be perfectly content eating only those meatballs, but I am always on the lookout for new recipes. 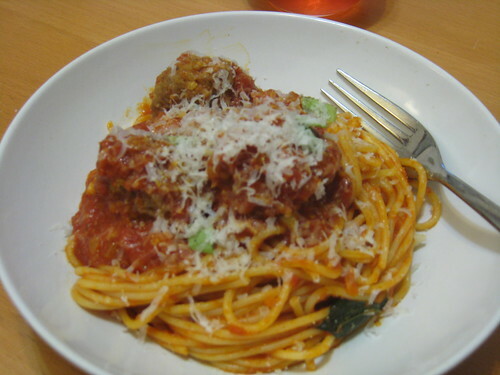 A couple of years ago I made Tyler's Florence's Ultimate Spaghetti and Meatballs almost exactly as written, and while I really liked it, I found the addition of mozzarella unnecessary, and I wanted to simplify it a bit (also, I find that Tyler can be a bit overzealous with the olive oil). Using that dish as a jumping off point, I developed a recipe that I have turned to again and again. These meatballs start with a panade, a mix of bread and milk, which keep them moist and tender. Sauteed onions and garlic provide a lot of flavor and additional moisture, and because they are precooked until soft they don't interrupt the texture of the meatball. This time I used all ground beef, but I think that they are especially tasty with a mixture of beef and pork. Once I even substituted hot Italian sausage for some of the beef, and the meatballs were delicious. My major departure from Tyler's recipe is how I cook the meatballs. In the past few years I have taken to baking them. It is easier because I don't have to stand at the stove browning the meatballs in batches, and it also allows me to use less oil. A nice brown crust on a meatball is fantastic, however, so you can go ahead and cook the meatballs in olive oil if you are not as concerned about calories (or as lazy) as I am. For my tomato sauce I like to start with a mix of olive oil and butter, and I add carrots and celery along with diced onion. I think that this gives the sauce a deeper flavor, and the sweetness of the butter and carrot keep the acidity of the tomatoes in check. As for those tomatoes, I like a mix of crushed and whole tomatoes, which gives the sauce a bit of textural contrast. A pinch of crushed red pepper also gives the sauce a little something extra without adding heat. As for serving this pasta, I am obsessed with adding sauce into the drained spaghetti and tossing it with copious amounts of grated parmesan (or pecorino romano) and freshly torn basil. Doing it this way allows the flavors of the sauce to penetrate the hot pasta, and the cheese gives it a bit of creaminess. Of course you may simply ladle sauce over plain noodles, but, for me, taking that extra step is what really pushes this dish to the next level of deliciousness. Also, the pasta topped with sauce reheats very well in the microwave, and the meatballs taste even better on subsequent days. In fact, just writing about this now is making me want more. Unfortunately for me, Andrew just ate the rest of the leftovers. Though, on second thought, perhaps I should say fortunately. I can put away a lot of spaghetti and meatballs. Preheat oven to 400 degrees. Line a baking sheet with foil and spray with nonstick spray. Set aside. Start the meatballs: Place the bread and milk in a medium mixing bowl and set aside. Heat a tablespoon of olive oil in a large skillet or sauce pot over medium heat. Add the onion, season with a pinch of salt, and saute until tender, about 5 to 7 minutes. Add the garlic and chopped parsley and continue cooking another minute or two. Scrape onto a plate and allow to cool. For the sauce: In the same pot, heat the butter and remaining tablespoon of olive oil over medium heat. Add the onion and a sprinkle of salt and cook until translucent, 3 to 4 minutes. 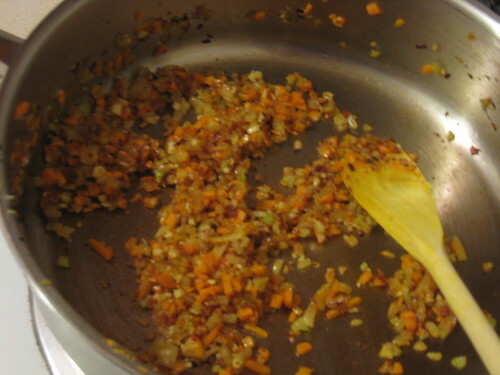 Stir in carrot and celery and continue cooking until the vegetables are tender and beginning to brown, 8 to 10 minutes. Add the garlic and a pinch or red pepper flakes, and cook, stirring, 2 minutes. Stir in the crushed tomatoes and then add the canned whole tomatoes, either breaking them up with your hands as you add them, or squishing them with the edge of a wooden spoon once they are in the pot. Bring the sauce to a bubble, then turn down the heat and allow the sauce to simmer while you make the meatballs. To the bowl with the bread and milk, add egg, grated cheese, and cooled onions and garlic. Mix thoroughly with a fork, then add ground beef. Mix gently with your hands until everything is incorporated. 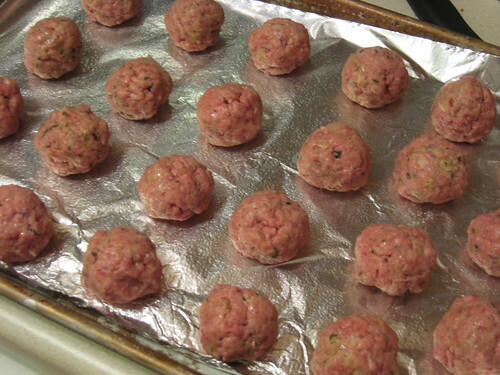 Form into meatballs, and place on the prepared sheet pan. I like to use a 2 tablespoon cookie scoop so that my meatballs are uniform. Place in a preheated oven for 10 to 15 minutes, until brown. Add the browned meatballs to the sauce, and continue simmering while you prepare the pasta. I like to cook the sauce for at least 30 minutes, to let the flavors meld. 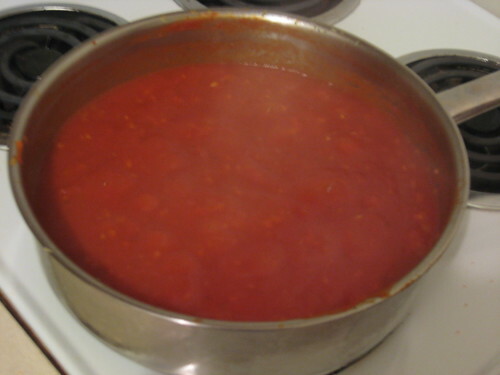 Bring a large pot of water to a boil, salt generously, then stir in the spaghetti. Boil until al dente, following the package directions. Drain, then return to pot. Taste your sauce, and season with salt and pepper. If the sauce is too acidic for your taste, you can mellow it out by adding a sprinkle of sugar or melting in a tablespoon or two of butter. Ladle about half of the sauce onto the pasta, then add the grated cheese and torn basil and toss with tongs until combined. You can also add a drizzle of good olive oil for some extra richness. Top the spaghetti with meatballs and extra sauce, and additional basil and parmesan.